For her tireless work on breaking down cultural barriers and fighting racism, Vernon city councillor Dalvir Nahal has been honoured by the province. Nahal is the founder of the hugely popular Bollywood Bang event, dedicated to increasing awareness of the Sikh culture and history. She has also been involved with numerous other projects focusing on cultural unity. “I am so honoured and humbled to receive this award from Premier Horgan because there’s so many amazing people who are doing amazing work. So, to be among them is humbling,” said Nahal, who received the award at a ceremony in Vancouver Thursday night. Nahal said she is proud of the way Vernon shows acceptance. The ceremony took place on the International Day for the Elimination of Racial Discrimination. 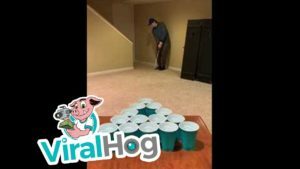 Hours of practice and attempts went into successfully making these trick shots.